2003-12-31 Assigned to STATE OF OREGON ACTING BY AND THROUGH THE STATE BOARD OF HIGHER EDUCATION ON BEHALF OF OREGON STATE UNIVERSITY, THE reassignment STATE OF OREGON ACTING BY AND THROUGH THE STATE BOARD OF HIGHER EDUCATION ON BEHALF OF OREGON STATE UNIVERSITY, THE ASSIGNMENT OF ASSIGNORS INTEREST (SEE DOCUMENT FOR DETAILS). Assignors: ERDEM, SERDAR S., KOC, CETIN K.
Multi-precision multiplication methods over GF(2m) include representing a first polynomial and a second polynomial as an array of n words. A recursive algorithm may be used to iteratively decompose the multiplication into a weighted sum of smaller subproducts. When the size of the smaller subproducts is less than or equal to a predetermined size, a nonrecursive algorithm may be used to complete the multiplication. The nonrecursive algorithm may be optimized to efficiently perform the bottom-end multiplication. For example, pairs of redundant subproducts can be identified and excluded from the nonrecursive algorithm. Moreover, subproducts having weights in a special form may be efficiently calculated by a process that involves storing and reusing intermediate calculations. This application claims the benefit of U.S. Provisional Patent Application No. 60/401,574, filed Aug. 6, 2002, and U.S. Provisional Patent Application No. 60/419,204, filed Oct. 16, 2002, both of which are incorporated herein by reference. Many cryptographic applications use finite field arithmetic. For example, elliptic curve cryptography typically operates in the finite field GF(2 m). The multiplication operation in finite-field applications can be particularly slow and inefficient. Several techniques have been proposed to perform fast arithmetic operations over GF(2m). One technique, for example, uses an optimized normal basis representation. See R. Mullin et al., Optimal Normal Bases in GF(pn), Discrete Applied Mathematics, Vol. 22, pp. 149-161 (1988). Although optimal normal basis multiplication is efficient in hardware, it is not efficient in software, and an optimal normal basis representation does not exist for all field sizes. Another technique involves embedding GF(2m) in a larger ring Rp where the arithmetic operations can be performed efficiently. See J. H. Silverman, Fast Multiplication in Finite Field GF(2N), Cryptographic Hardware and Embedded Systems, pp. 122-134 (1999). This method, however, works only when m+1 is a prime, and 2 is a primitive root modulo m+1. Another technique involves using a standard basis with coefficients in a subfield GF(2r). See E. De Win et al., A Fast Software Implementation for Arithmetic Operations in GF(2n), Advances in Cryptology—ASIACRYPT 96, pp. 65-76 (1996); J. Guajardo and C. Paar, Fast Efficient Algorithms for Elliptic Curve Cryptosystems, Advances in Cryptology—CRYPTO 97, pp. 342-356 (1997); and C. Paar and P. Soria-Rodriguez, Fast Arithmetic Architectures for Public-Key Algorithms Over Galois Fields GF((2n)m), Advances in Cryptology—EUROCRYPT 97, pp. 363-378 (1997). In this method, however, the field size m must be a multiple of r, and look-up tables are required to perform the calculations in GF(2r). Still another technique involves adapting Montgomery multiplication for the fields GF(2m). See C. Koc and T. Acar, Montgomery Multiplication in GF(2k), Designs, Codes and Cryptography, 14(1):57-69 (April 1998). Methods and apparatus for multiplying multi-precision numbers over GF(2 m) using a polynomial representation are disclosed. The disclosed methods may be used in a number of different applications that utilize multi-precision arithmetic. For example, the method can be used to generate various cryptographic parameters. In one particular implementation, for instance, a private key and a base point are multiplied using one of the disclosed methods to obtain a product that is associated with a public key. In this implementation, the private key and the base point are multi-precision polynomials. The disclosed methods may similarly be used in a signature generation or signature verification process (e.g., the Elliptic Curve Digital Signature Algorithm (ECDSA)). In an exemplary embodiment, a method is disclosed that includes representing the first polynomial and the second polynomial as an array of n words, wherein n is an integer. A recursive algorithm is used to decompose a multiplication of the first polynomial and the second polynomial into a weighted sum of iteratively smaller subproducts. A nonrecursive algorithm is used to complete the multiplication when a size of the smaller subproducts is less than or equal to a predetermined size, the predetermined size being at least two words. The recursive multiplication algorithm may be, for instance, a Karatsuba-Ofman algorithm, and the predetermined size may be, for example, six words. The nonrecursive multiplication algorithm may be optimized so that it operates more efficiently. For example, the nonrecursive algorithm may exclude pairs of redundant subproducts, or store and reuse previously calculated intermediate values. The previously calculated intermediate values may be part of a weighted sum of subproducts having special weights. 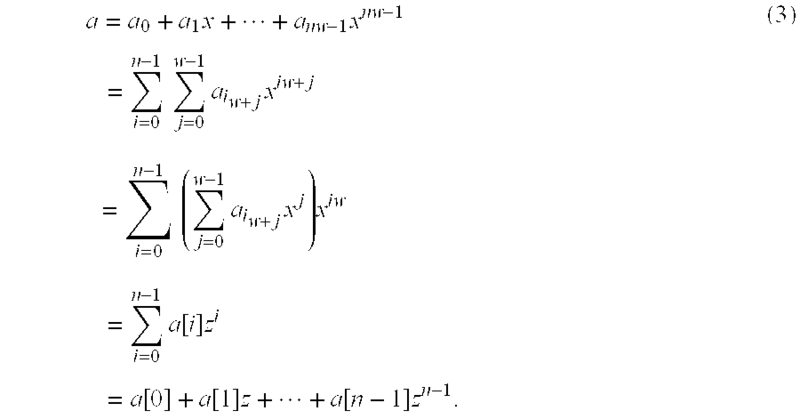 For example, these subproducts may have weights z of the form Σ j=0 n−1 zi+j for i=0, . . . , n−1, where i and j are index integers. In another exemplary embodiment, a method of nonrecursively multiplying a first polynomial and a second polynomial over GF(2) is disclosed. A first polynomial and a second polynomial are represented as n words, where n is an integer greater than one. A partial result is determined by calculating a weighted sum of one-word subproducts having weights z of the form Σ j=0 n−1 zi+j for i=0, . . . , n−1, wherein i and j are index integers. The partial result is updated by adding any remaining one-word subproducts. The method may also include identifying and excluding pairs of redundant one-word subproducts. Moreover, during the calculation of the partial result, intermediate calculations may be stored in a memory and reused. In yet another exemplary embodiment, a method of deriving an algorithm for multiplying a first polynomial and a second polynomial over GF(2) is disclosed. The product of a first polynomial and a second polynomial is decomposed into a weighted sum of one-word subproducts. Pairs of redundant one-word subproducts are identified and removed from the weighted sum, resulting in a revised weighted sum having fewer XOR operations. In one particular implementation, the first or second polynomial is padded with zeros so that the polynomial has an even number of words. In this implementation, the zero-padded polynomials may be excluded from the revised weighted sum. In another implementation, the one-word subproducts having weights z of a form Σ j=0 n−1 zi+j for i=0, . . . , n−1 are identified. These one-word subproducts can be calculated in a weighted sum by a process of storing and reusing the intermediate calculations. These and other features of the disclosed technology are described below with reference to the accompanying figures. FIG. 1 is a flowchart showing a general method of multiplying multi-precision polynomials over GF(2 m). FIG. 4 is a block diagram showing a selected path on the recursion tree of FIG. 3. FIG. 5 is a flowchart showing a general method of nonrecursively multiplying multi-precision polynomials over GF(2 m). FIG. 10 is a block diagram of a cryptographic system configured to perform multi-precision multiplication according to the disclosed methods and to output a cryptographic parameter. The elements in GF(2 m) can be represented in various bases. For purposes of this disclosure, the standard basis representation for GF(2m) is used. In the standard basis, the field elements are represented as polynomials in the form a(x)=a0+a1x+. . . +am−1xm−1 where all ai are elements of GF(2m). The operations on these elements are performed modulo a fixed irreducible polynomial of degree m. Thus, standard basis multiplication in GF(2m) has two phases. The first phase consists of multiplying two polynomials over GF(2m) and the second phase consists of reducing the result modulo an irreducible polynomial of degree m. The complexity of standard polynomial multiplication is O(m2). Modulo reduction can be an even more time-consuming operation because it involves division. As seen, both phases of standard basis multiplication in GF(2 m) are quite costly. The cost of the first phase can be decreased by using the Karatsuba-Ofman Algorithm (KOA) to multiply the polynomials over GF(2m). The KOA is a multiplication algorithm whose asymptotic complexity is O(m1.58). Thus, its computational cost is less than the standard O(m2) multiplication for large m values. The second phase can also be decreased by choosing an irreducible polynomial with a small number of terms. In particular, a trinomial or pentanomial can be used as the irreducible polynomial. A trinomial is a polynomial 1+xa+xm with only three terms, while a pentanomial is a polynomial 1+xa+xb+xc+xm with only five terms. The complexity of the modulo reduction operation with a trinomial or a pentanomial is O(m). Further, a trinomial or a pentanomial can be found for any field size m<1000. Combining the KOA and modulo reduction with a trinomial or pentanomial yields a fast multiplication method for GF(2 m). This fast multiplication method works for all field sizes. As more fully discussed below, the first phase of this method (i.e., the phase in which the polynomials over GF(2m) are multiplied using the KOA) can be improved even further. The coefficients of the polynomials over GF(2 m) are 0 or 1 and operations on these coefficients are performed according to modulo two arithmetic. Thus, addition and subtraction of the coefficients is equivalent to performing XOR operations. As a result, the addition and subtraction of two polynomials can be performed by XORing the corresponding coefficients. Note that polynomial multiplication also depends on the XOR addition/subtraction operation because polynomial multiplication involves a series of coefficient additions. As mentioned before, the coefficients of the polynomial a are stored in n words. Thus, a polynomial a over GF(2 m) can be viewed as an n-word array. According to this analogy between the polynomials and the arrays, the polynomial a[i] for i=0, . . . , n−1 is the ith word of a and the binary-valued coefficients are bits. For purposes of this disclosure, the following arithmetic operations on the polynomials over GF(2 m) are used: (1) polynomial addition; (2)multiplication of a polynomial by powers of z; and (3) polynomial multiplication. Note that the multiplication by z i involves array indexing and does not use any computation. As more fully described below, the KOA algorithm may be modified such that the recursions are stopped early and a bottom-level multiplication is performed using some nonrecursive algorithms. These nonrecursive algorithms may be derived from the KOA by removing its recursions. Moreover, the algorithms may be optimized by exploiting the arithmetic of the polynomials over GF(2 m). Consequently, the complexity and recursion overhead can be reduced. For purposes of this disclosure this modified embodiment of the KOA is termed the LKOA, or “lean” implementation of the KOA. where  b L = b  [ 0   #  ⌈ n 2 ⌉ ]   and   b H = b  [ ⌈ n 2 ⌉   #  ⌊ n 2 ⌋ ] . The above equation shows that three multiplications of half-sized polynomials are sufficient to compute t=ab instead of four. First, the products of a LbL, (aL+aH)(bL+bH), and aHbHare found. Then, the results are multiplied by the appropriate powers of z and added to one another to obtain t=ab. The multiplication by the powers of z can be implemented as array shifts. In Step 1, n is evaluated. If n is one (i.e., if the inputs are one-word inputs), the inputs are multiplied using classical methods and the result returned. Otherwise, the function continues to the remaining steps. In Steps 2 through 5, two pairs of half-sized polynomials (a L, bL) and (aH, bH) are generated from the lower- and higher-order words of the inputs. In Steps 6 and 7, another pair, (aM, bM), is obtained by adding aL with bLand aHwith bH. In Steps 8, 9, and 10, these three pairs are multiplied. These multiplications are performed by three recursive calls to the KOA function and yield the subproducts low, mid, and high. Finally, t=ab is computed from the subproducts in Step 11, as shown in the Equation (13). These subproducts are low=a LbL, high=aHbH, and mid=aMbM=(aL+aH) (bL+bH). The recursion overhead degrades the performance of the KOA. Thus, it is desirable to stop the KOA recursions early and perform the bottom-level multiplications using some nonrecursive method. For this, Step 1 of the KOA function (as outlined above) can be modified. For example, the recursion can be stopped when n≦n 0 where n0 is some predetermined integer. A nonrecursive function can then be called to perform the remaining multiplication. A variety of different nonrecursive algorithms can be used to multiply the polynomials of size n≦n 0. For example, in one exemplary embodiment, the polynomials are multiplied on a word-by-word basis, as shown above in the section discussing polynomial multiplication over GF(2m). In another exemplary embodiment, a series of nonrecursive algorithms derived from the KOA can be used. These algorithms are each specific to a fixed input size and multiply 2, 3, . . . n-word polynomials respectively. The algorithms may be used in a variety of different combinations and subcombinations with one another. For instance, one particular embodiment uses the 2, 3, 4, 5, and 6-word nonrecursive multiplication algorithms described below in combination with the KOA. The details of the particular algorithms described may be modified in a number of ways (e.g., the sequence in which the various subproducts are computed may be altered) without departing from the scope of the present disclosure. In this exemplary implementation, KOA2, KOA3, KOA4, KOA5 and KOA6 are the algorithms derived from the KOA. To obtain these algorithms, the recursions of the KOA, as well as the inherent redundancies in the KOA, are removed by exploiting the arithmetic of the polynomials over GF(2 m). As noted above, this type of implementation is termed a lean implementation of the KOA, or LKOA. FIG. 1 is a flowchart  100 showing a general method of implementing the LKOA. At process block 110, two n-word operands a and b are obtained or received. As described above, the operands a and b comprise multiple words of one or more bits and represent a polynomial in GF(2m). At process block 112, a recursive algorithm is used to decompose the multiplication of a and b into a weighted sum of smaller subproducts. The recursive algorithm utilized may be the KOA or a similar divide-and-conquer algorithm. As shown by process block 114, the decomposition continues until the size of the operands of the subproducts reaches a predetermined size. For example, in the exemplary implementation described above, the recursive algorithm is used to decompose the products until the operands are six words or less. When the operand size is less than the predetermined size, process block 116 shows that a nonrecursive algorithm is used to determine the smaller subproducts. The nonrecursive algorithm used may, for instance, be one of the nonrecursive algorithms described below, or another nonrecursive algorithm that efficiently determines the relevant subproduct. At process block 118, the values of these subproducts are used in the weighted sum of process block 112 to complete the calculation. At process block 120, the final value of the weighted sum is returned. As mentioned before, two operands in GF(2 m) can be multiplied together in two phases. In the first phase, the (n=┌m/w┐)-word polynomials representing the elements are multiplied and the 2n-word product polynomial obtained. In the second phase, the product polynomial is reduced with an irreducible polynomial of degree m. In this way, an (n=┌m/w┐)-word polynomial representing the multiplication result in GF(2m) is obtained. The polynomial multiplication in the first phase may be performed on a word-by-word basis using the straightforward MULGF2 multiplication algorithm described above. According to this method, however, the first phase is quadratic in time (i.e., O(m 2)). Alternatively, the LKOA may be used to perform the first phase of polynomial multiplication. Because the LKOA runs in less than quadratic time, even for small values of m, the overall time for multiplication is decreased. The LKOA runs faster than the straightforward multiplication algorithm because it trades multiplications in favor of additions. In particular, the LKOA reduces the number of 1-word multiplications (MULGF2) at the expense of more 1-word additions (XOR). Because the MULGF2 operation is costly to implement, the tradeoff results in a more efficient multiplication algorithm. Indeed, the emulation of MULGF2 takes hundreds of clock cycles for a typical value having a word size w=32. By contrast, the XOR operation is a simple operation that is performed in a single clock cycle in many processors. Table 6, discussed below, shows the number of XOR and MULGF2 operations needed for the KOA, the LKOA, and the straightforward polynomial multiplication. As seen in Table 6, the KOA and the LKOA use fewer MULGF2 operations than the straightforward polynomial multiplication for all n=┌m/w┐. For many applications, the LKOA can be used to multiply polynomials with no or little recursion. For example, the LKOA can be used in the finite fields GF(2 m) for 163≦m≦512, which are used in elliptic curve cryptography. If a word size w=32 is used, for instance, then the polynomials representing the field elements are in the range of 6 to 16 words. When the LKOA multiplies 6-word polynomials, there is no recursion. Thus, in Step 1, the nonrecursive function KOA6 is called for the computation. When the LKOA multiplies 16-word polynomials, only two levels of recursive calls are used. In the first recursion level, the input size is reduced to 8-word polynomials. In the second recursion level, the input size is reduced to 4-word polynomials, and the inputs are multiplied by the nonrecursive function KOA4. In the second phase of the GF(21) multiplication, the result of the polynomial multiplication is reduced with a trinomial or pentanomial of degree m. This computation has a linear time of O(m). The implementation of the reduction with a trinomial or pentanomial, for example, is relatively simple and straightforward. See, e.g., R. Schroeppel et al.,  Fast Key Exchange with Elliptic Curve Systems, Advances in Cryptology—CRYPTO 95, pp. 43-56 (1995). In its simplest form, the recursion tree of an algorithm can be thought of as a hierarchical tree structure wherein each branch represents a recursive call of the algorithm. FIG. 2 shows an exemplary recursion tree  200 that depicts the multiplication of two exemplary polynomials using an algorithm similar to the KOA. For purposes of the example shown in FIG. 2, assume that the recursion stops when the subproducts reach a size of one word, at which point they can be calculated using classical methods. In the example shown in FIG. 2, the polynomials 1+x+x3+x4 and 1+x3+x5 are multiplied together. In FIG. 2, these polynomials are written as a string of two-bit words (i.e., as three words) showing the binary value of each polynomial's coefficients. Thus, the first polynomial 1+x+x3+x4 is denoted as “110110” and the second polynomial 1+x3+x5 is denoted as “100101.” The initial call to the algorithm is represented by the root 210 of the tree 200. The recursive calls made by the initial call constitute the first level of recursion 220 and are represented by the first-level branches 222, 224, 226 emerging from the root 210. The recursive calls made by these recursive calls constitute the second level of recursion 230 and are represented in the recursion tree 200 by the second-level branches 231 through 236 emerging from the first-level branches 222, 224. Note that branch 226 does not have any second-level branches stemming from it because branch 226 represents the product of one-word operands and can be calculated using classical methods (e.g., a MULGF2 operation supporting 2-bit words). In the recursion tree depicted in FIG. 2, two recursive calls are made by the branches  222 and 224. Thus, three branches, representing a recursive KOA function, emerge from each of these branches. The leaves 231 through 236 and 226 represent the multiplication of one-word inputs, which do not make any recursive calls because they can be calculated using classical methods. Generally speaking, the size of the input parameters are reduced by half in each successive recursion level in the recursion tree. Thus, it is known that at some level, the branches will have one-word inputs and cease to make any further recursive calls. In the KOA, there are three choices for a branch. A branch either takes the input pair (a L, bL) from its parent and returns the subproduct low, takes the input pair (aH, bH) and returns the subproduct high, or takes the input pair (aM, bM) and returns the subproduct mid. For purposes of this disclosure, these first, second, and third types of branches are called low, high, and mid branches respectively. This classification of the branches is given in Table 1 below. where LeafProduct i is a particular leaf-product, and Weighti is a polynomial in z. 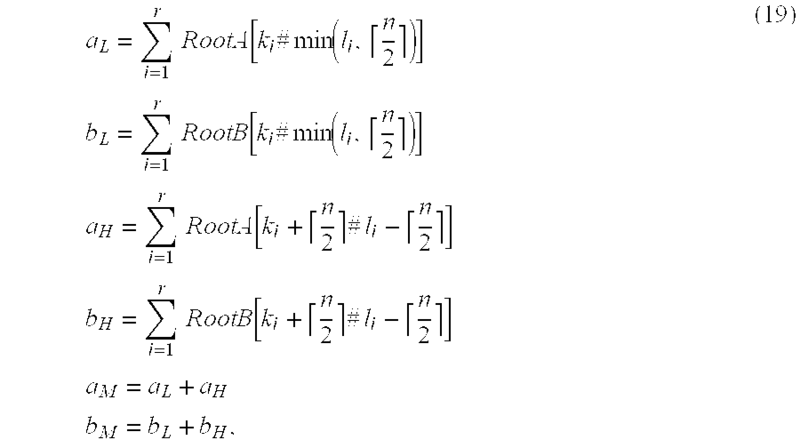 The factors of Weight i in Equation (15) are generated by the recursive decompositions performed along the path between the root and the leaf computing LeafProducti. These factors are the weights of the subproducts introduced during the decompositions and can be determined by the help of Table 2. Now consider t, t′, t″, and t′″, respectively, which denote the products computed by the root, its child, its grandchild, and its grandgrandchild along a given path. For purposes of this example, let the child, grandchild, and grandgrandchild be mid, high, and low branches, respectively. FIG. 4 illustrates this path on the recursion tree  300. In particular, path 400 originates at the root 410 (i.e., t), and proceeds to its mid child 412 (t′), then to its high grandchild 414 (t″), and finally to its low grandgrandchild 416 (t′″). The recursive decomposition of the products t, t′, and t″ is illustrated in Table 3.
words, and its weight is z (n+1)/2=z5. Next, t′ is decomposed for n=5. Note that n=5 so that t′ has (2n=10) words. In this manner, t″ can also be decomposed. The product t′″, however, cannot be decomposed because it has (n=1)-word inputs and is computed at a leaf. Indeed, the leaf-product t′″ is computed by direct multiplication having (n=1)-word inputs. The product t in this example corresponds to RootProduct in Equation (14), whereas t′″ corresponds to LeafProducti for some i. Similarly, Weighti corresponds to the accumulated weight of t′″ (i.e., Weighti=(1+z)(z3+z6)z5). To find LeafProduct i, the inputs LeafA and LeafB must be found. The inputs of the leaves and the branches are defined from the inputs of their parent in Steps 2 through 7 of the KOA function. Note that all these inputs are actually derived from the inputs of the root, which is the ancestor of the all the branches and the leaves. Proposition 1: Let the indices and lengths describing the inputs of the parent be k i and i l for i=1 . . . , r. Then, the indices and lengths describing the children's inputs are as given in Table 4. Note that because some lengths in the table are obtained by subtractions, they can be nonpositive. The subarrays with nonpositive lengths are equal to zero. for i=1, . . . , r, as seen in Equation (19)). Note that these lengths can be nonpositive due to the subtraction. If a length is nonpositive, the corresponding subarray equals to zero. Third, as seen in Steps 6 and 7 of KOA function, a M (bM) is the sum of the aL and aH (bL and bH). respectively, according to Table 4. After the substitutions k i=k1=0, li=l1=9, and n=9, the indices and lengths describing the inputs of the root's child (a′, b′) are found. These indices and lengths are k1, k2=0,5 and l1, l2=5,4, as seen in Table 5. The size of the inputs (a′, b′) is the new n value, and n=max(l1, l2)=max(5, 4)=5. In this fashion, the indices and lengths describing the inputs (a″, b″) and (a′″, b′″) are found. The inputs (a′″, b′″) comprise (n=1) word. Thus, they are the inputs of the leaf at the end of the path. The indices and lengths describing them are k1, k2=3,8 and l1, l2=1, 1, as seen in Table 5. This means that a ′′′ = a  [ 3 ] + a  [ 8 ]   and   b ′′′ = b  [ 3 ] + b  [ 8 ] . The above equation provides that t=Σ i=0 n−m−1 lpi wi′. However, the desired equation is t=Σi=0 n−m−1 lpiwi. Thus, t must be multiplied by zm to obtain the final result. For this, the index of every word of t is increased by m in the above equation. That is, t[index] is replaced with t[index+m]. This shift in the array representation is the equivalent of multiplying by zm. Also, zeros are inserted into the first m word. After the change of variable i=i+m and some rearrangement, Equation (34) can be obtained. FIG. 5 is a flowchart showing generally how the nonrecursive algorithms operate. As shown by the dashed l i nes, the flowchart of FIG. 5 corresponds generally to process block 416 of FIG. 1. At process block  510, the subproduct to be calculated is decomposed into a weighted sum of subproducts having one-word inputs. This decomposition may proceed, for instance, in the manner described above for finding the value and respective weights of the leaf-products from the corresponding recursion tree. At process block 512, algebraic substitutions are performed to identify pairs of identical subproducts. These redundant subproducts are then removed from the weighted sum. The pairs of redundant subproducts can be removed because their sum is zero in GF(2m), thereby reducing the number of XOR operations that need to be performed to obtain the relevant subproduct. At process block 514, subproducts having the form described above in Proposition 2 are identified and grouped so that they can be efficiently calculated using the described method. At process block 516, a weighted sum according to Proposition 2 is calculated, thereby producing a partial result of the subproduct. As shown in Equation (24), this weighted sum can be obtained using previously calculated intermediate values (e.g., t[i−1] and t[i+1]), which may be stored once they are calculated. This procedure of storing and reusing intermediate values also reduces the number of XOR operations that need to be performed in order to obtain the desired product. At process block 518, the remaining subproducts having one-word inputs are calculated and used to update the partial result. The updated partial result produces the final product, which is returned at process block 520. Each row above is indexed with i. The ith row contains the ith leaf-product denoted by lp i, and its weight is denoted by wi. The first two weights can be written as Σ j=0 n−1 zi+j for i=0, . . . , n−1 where n=2. These weights are in the form mentioned in Proposition 2. Thus, the weighted sum of the first two leaf-products lp0 and lp1 can be computed efficiently, as described in the proposition. But, this weighted sum is only a partial result for t. To obtain t, this partial result must be added to the weighted sum of the remaining leaf-products in the list above (i.e., to (a+a) (b+b) z). Each row above is indexed with i. The ith row contains the ith leaf-product denoted by lp i, and its weight denoted by wi. Note that two of the leaf-products are redundantly the same. Each row above is indexed with i. The ith row contains the ith leaf-product denoted by lp i and its weight denoted by wi. The first four weights can be written as Σ j=0 n−1 for i=0, . . . , n−1 where n=4. Also, the fourth and the fifth weights can be written as zm Σj=0 n−m−1 zi+j for i=0, . . . , n−m−1 where n=4 and m=2. These weights are in the forms mentioned in Proposition 2. Thus, the weighted sum of the first six leaf-products lp0, lp1, lp2, lp3, lp4, and lp5 can be computed efficiently, as described in the proposition. But, this weighted sum is only a partial result for t. To obtain t, this partial result must be added to the weighted sum of the remaining leaf-products in the list above. The function above needs 38 word-additions (XOR) and 9 word-multiplications (MULGF2). Note that, when lp 6, lp7, and lp8, are computed, 4 XOR operations can be gained at the expense of additional storage. where the LeafProduct i's are defined from the words of n/2-word polynomials. In general, in one exemplary embodiment, optimizing the leaf-products and weights means that: (1) no leaf-products are redundantly the same; and (2) the weights are in the form mentioned in Proposition 2 and its corollary. In this sense, the leaf-products and the weight which are derived for the multiplication of n-word polynomials in the previous section are optimum so long as LeafProduct i and Weighti are optimum. Further, the leaf-products and the weights which are derived for the multiplication of (n−1)-word polynomials are not optimum, even if LeafProducti and Weighti are optimum. According to the criteria recited above, Weight i are optimum if Weight i = ∑ j = 0 n / 2 - 1   z i + j  for   i = 0 , ⋯  , n / 2 - 1. The function above needs 57 word-additions (XOR) and 14 word-multiplications (MULGF2). Note that when lp 7, lp12, and lp13 are computed, 4 XOR operations are gained at the expense of additional storage. The performance of the disclosed GF(2 m) multiplication methods mainly depend on the performance of the particular LKOA implemented. The cost of the modulo reduction operation is typically less significant if a trinomial or pentanomial is selected as the irreducible polynomial. In the following table, the number of XOR and MULGF2 operations required to multiply polynomials having a size between 2 and 6 words using standard multiplication, the KOA, and the LKOA described above is given. As seen in Table 6, the standard multiplication needs n 2 MULGF2 operations to compute the partial products and needs 2n(n−1) XOR operations to combine these partial products. The number of XOR and MULGF2 operations required for the KOA is calculated using a computer program, such as a Maple program. As seen from Table 6, the LKOA and the KOA need more XOR operations. However, the LKOA and the KOA need fewer MULGF2 operations than the standard multiplication. Because the emulation of MULGF2 is very costly, the LKOA and the KOA outperform the standard multiplication. In comparison to other methods, GF(2 m) multiplication with the LKOA is more efficient, can be implemented in software in a computer-based environment, does not require a look-up table, and does not have a restriction on the field size m. Although the LKOA may require extra code size, the overall code size is still very reasonable. For example, the code for the particular implementation discussed above in the C programming language requires at most 5 kbytes. A multiplication method using both the LKOA and the KOA for calculating polynomials in GF(2 m) may be implemented in software. Trinomials and pentanomials may be used for the reduction procedure that follows multiplication. Table 7 gives the timing results for two particular implementations for multiplying GF(2m): (1) the LKOA; and (2) the KOA. The multiplication time for the finite fields GF(2 163), GF(2211), GF(2233), and GF(2283), which are commonly used in the elliptic curve cryptography, were measured. The particular platform used in the measurement was a 450-MHZ Pentium II machine with 256 Mbyte RAM. The timing results show that the LKOA is nearly two times faster than the KOA for GF(2m) multiplication. The operation of one of the nonrecursive algorithms is illustrated in the following example and in FIGS. 6 through 8. In particular, FIGS. 6 through 8 illustrate the operation of the KOA3 algorithm by relating it to the recursion tree of FIG. 2. In this example, two polynomials “110110” and “100101” (i.e., 1+x+x 3+x4 and 1+x3+x5) are multiplied together. 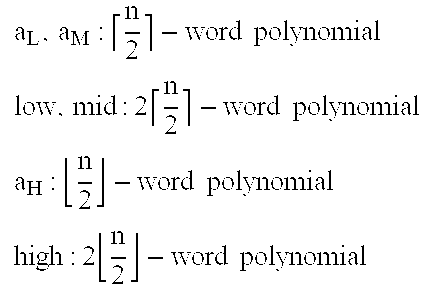 Both polynomials comprise three two-bit words. Thus, the operand size is n=3, and the word size is w=2. Let a denote 110110 and a[i] denote the ith bit of 110110. Also, let b denote 100101 and b[i] denote the ith digit of 100101. The first process in the KOA3 algorithm is to compute the first three leaf-products lp 0, lp1, and lp2. In particular, these subproducts are lp0=11*10=1100, lp1=01*01=0010, and lp2=10*01=0100. As shown in F these subproducts correspond to branches of the related recursion tree. In particular, lp0 corresponds to branch 231, lp 1 corresponds to branches 233 and 236, and ip2 corresponds to branch 226. The fourth process in the KOA3 algorithm is to determine the remaining leaf-products lp 3, lp4, and lp5. In particular, these subproducts are lp3=10*11=1100, lp4=01*11=0110, and lp5=11*00 =0000. As shown in FIG. 8, these subproducts correspond to branches of the related recursion tree. In particular, lp3 corresponds to branch 232, lp4 corresponds to branch 234, and lp5 corresponds to branch 235. Note that lp5 no longer corresponds precisely to branch 235, but has instead been modified through the algebraic substitutions recited above to comprise the subproduct (a+a)(b+b). As more fully discussed above, the algebraic substitutions can performed to maximize the number of one-word subproducts having weights in the form Σj=0 n−1 zi+j for i=0, . . . , n−1, which can be efficiently calculated. In one particular implementation, the methods are used, at least in part, to generate and verify a key pair or to generate and verify a signature according to the ECDSA. For example, the methods may be used to compute Q=dG during the key pair generation process, wherein Q is a public key, d is a private key, and G is a base point. Moreover, the methods may be used to verify that nQ=O during the key pair verification process, wherein n is the order of the point G, and O is the point at infinity of the elliptic curve. Similarly, the methods may be used to compute kG=(x 1,y1), wherein k is a random or pseudorandom integer, and (x1, y1) are points on an elliptic curve. The methods may similarly be used to calculate the related modular, inverse modular, and hash functions during the signature generation and verification processes. Any of the methods described above may be implemented in a number of different hardware and/or software environments. FIG. 11 shows a block diagram of one exemplary general hardware implementation. More particularly, FIG. 9 shows a multiplying apparatus  900 (e.g., a computer) that includes a processor 910 (e.g., a microprocessor), memory 912 (e.g., RAM or ROM) and an input data path 914. Any one of the multiplication methods described above may be stored in the memory or on a computer-readable medium (e.g., hard disk, CD-ROM, DVD, floppy disk, RAM, ROM) that is separate from the memory 912 and accessible by the processor 910 before or during execution of the algorithm. During operation, the input operands (e.g., polynomials) may be supplied via the input data path 914 or by the memory 912. The processor 910 and the memory 912 are coupled together via the data paths 916, which enable the various read and write operations performed during the algorithm. The final product computed by the processor 910 may be output from the processor on output data path 916 or stored in the memory 912 for later use. The details of this general hardware implementation are omitted. As noted, the disclosed methods may be used in cryptography to help compute a variety of cryptographic parameters using multi-precision multiplication. FIG. 10 shows a block diagram of a general cryptographic apparatus  940 that may be used to multiply two operands to produce a cryptographic parameter. The apparatus 940 includes a cryptographic processor 950 used to perform the algorithm; memory 952 used to store the operands, the intermediate results, and computer-executable instructions for performing the algorithm; and an input data path 954. The apparatus 940 operates much like the apparatus described in FIG. 9, but produces a cryptographic parameter at its output 956. The cryptographic parameter may be related to or constitute a portion of a public key, private key, ciphertext, plaintext, digital signature, or some combination thereof. The parameter may also constitute a number of other values used in cryptography. The cryptographic apparatus 940 may be included in a variety of security applications. For instance, the apparatus 940 may be included in a secure transaction server used for financial transactions, confidential record storage, SmartCards, and cell phones. using a nonrecursive algorithm to complete the multiplication when a size of the smaller subproducts is less than or equal to a predetermined size, the predetermined size being at least two words. 2. The method of claim 1, wherein the predetermined size is six words. 3. The method of claim 1, wherein the recursive multiplication algorithm is a Karatsuba-Ofman algorithm. 4. The method of claim 1, wherein the step of using a nonrecursive multiplication algorithm includes the step of excluding pairs of redundant subproducts. 5. The method of claim 1, wherein the nonrecursive multiplication algorithm stores and reuses previously calculated intermediate values to determine subsequent intermediate values. 6. The method of claim 5, wherein the previously calculated intermediate values are used to determine a weighted sum of subproducts having weights z of the form Σj=0 n−1 zi+j for i=0, . . . , n−1, wherein i and j are index integers. where t[i] is the ith word of t.
8. The method of claim 1, wherein at least one of the first and the second polynomials corresponds to at least a portion of a private key, and a product of the first polynomial and the second polynomial corresponds to a public key. 9. The method of claim 1, wherein the first polynomial and the second polynomial are cryptographic parameters and the multiplication is associated with signature generation. 10. The method of claim 9, wherein the signature generation is associated with an elliptic curve digital signature. 11. The method of claim 1, wherein the first polynomial and the second polynomial are associated with cryptographic parameters and the multiplication is associated with signature verification. 12. The method of claim 11, wherein the signature verification is associated with an elliptic curve digital signature. 13. A computer-readable medium, comprising instructions for performing the method of claim 1.
updating the partial result by adding remaining one-word subproducts. 15. The method of claim 14, further comprising identifying and excluding pairs of redundant one-word subproducts. reusing the stored intermediate calculations. 18. The method of claim 14, wherein at least one of the first and the second polynomials is associated with a private key, and a product of the first polynomial and the second polynomial is associated with a public key. 19. The method of claim 14, wherein the first polynomial and the second polynomial are cryptographic parameters and the multiplication is associated with signature generation. 20. The method of claim 19, wherein the signature generation is associated with an elliptic curve digital signature. 21. The method of claim 14, wherein the first polynomial and the second polynomial are cryptographic parameters and the multiplication is associated with signature verification. 22. The method of claim 21, wherein the signature verification process is associated with an elliptic curve digital signature. 23. A computer-readable medium, comprising instructions for performing the method of claim 14.
removing the pairs of redundant one-word subproducts from the weighted sum, thereby obtaining a revised weighted sum. 25. The method of claim 24, wherein the first polynomial and the second polynomial have n−1 words, where n is an even integer, and wherein the first and the second polynomials are padded with zeros such that the first polynomial and the second polynomial can be represented as n words. 26. The method of claim 24, wherein the zero-padded words of the first and the second polynomials are excluded from the revised weighted sum. 27. The method of claim 24, further comprising identifying the one-word subproducts having weights z of a form Σj=0 n−1 zi+j for i=0, . . . , n−1 through algebraic substitutions, wherein i and j are index integers, and n is a number of words in the first and second polynomials. 28. The method of claim 27, further comprising calculating a weighted sum of the one-word subproducts having weights of Σj=0 n−1 zi+j for i=0, . . . , n−1 by storing and reusing intermediate calculations. 29. A nonrecursive algorithm determined by the method of claim 24. 30. A computer-readable medium, comprising instructions for performing the nonrecursive algorithm of claim 24.
outputting a cryptographic parameter associated with the multiplication. 32. The method of claim 31, wherein the predetermined size is six words. 33. The method of claim 31, wherein the recursive multiplication algorithm is a Karatsuba-Ofman algorithm. 34. The method of claim 31, wherein the nonrecursive multiplication algorithm excludes pairs of redundant subproducts. 35. The method of claim 31, wherein the nonrecursive multiplication algorithm uses previously calculated, stored weighted sums to determine subsequent weighted sums. 36. The method of claim 31, wherein at least one of the operands corresponds to a private key, and the cryptographic parameter is a public key. 37. The method of claim 31, wherein the cryptographic parameter is used in digital signature generation or digital signature verification. 38. The method of claim 37, wherein the signature generation is associated with an elliptic curve digital signature. means for outputting the product of the first polynomial and the second polynomial.